The Texans and Bengals both had bad losses to start the season in Week 1, but which of the two came away with their first win of the year on Thursday night? The Houston Texans and Cincinnati Bengals each came into Week 2 winless after a rough weekend of season openers last Sunday, but a positive had to come for one team as each hoped for their first win of the year on Thursday night. In the end, the Texans pulled it out with a 13-9 win. After we saw the first action from Deshaun Watson last Sunday against the Jacksonville Jaguars, fans were clamoring for more from the rookie quarterback under center for the Texans, and they definitely got it in the end. Watson put on an incredible performance to earn his first win for the team, and beat a very tough team on the road for his first career victory. However, another huge piece of the win came on the other side of the ball when the Texans defense finally showed up and performed well despite injuries. They kept the Bengals offense in check, with Andy Dalton struggling offensively for the second week in a row. The rookie quarterback put on a stellar show, and gave himself the best birthday gift any NFL quarterback can ask for under center: a win. Watson didn’t look like a rookie on Thursday night, and even showed off some speed to go along with an impressive performance with his arm throughout the night. He ran in a touchdown from over 40 yards, and was delivering strikes to DeAndre Hopkins and his receiving corps all night long. If Watson can keep this up, the Texans have a bright future ahead of them under center, and they may have found a potential star for years to come in this league as he matures more and more. 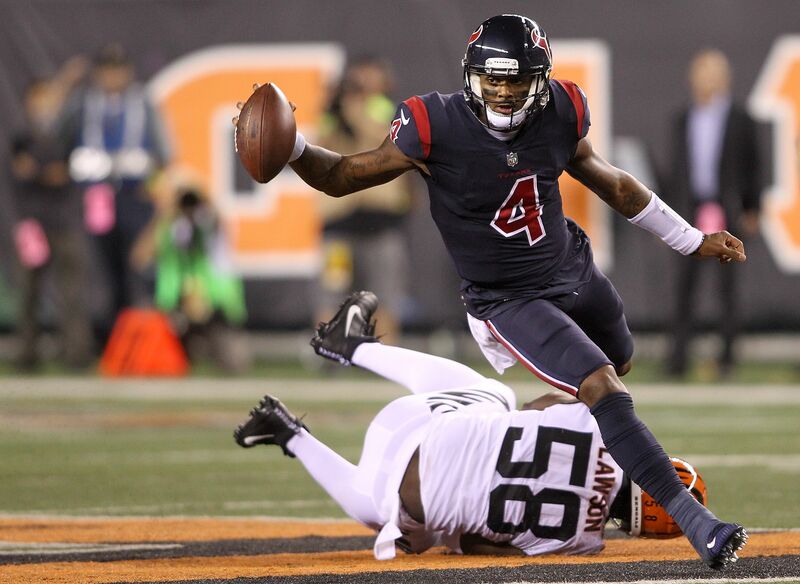 While Watson had himself an impressive night on the field with his arm, a big piece of his success was due to having Hopkins and his crazy hands to help him out. Hopkins was all over the place on Thursday night, leading the team in catches with some insane grabs to add to his highlight reel. He and Watson are on the same page, and they should be a dynamic duo for the rest of the year. The Texans defense picked up the slack on Thursday night after a horrible performance against the Jaguars, and a big piece of the defensive success came from Jadeveon Clowney on the line. He had a solid fumble recovery and return to show off his speed and ability to move with the ball, and added some key tackles along the way to help out where he was supposed to. The Texans defensive line looks to be coming back to its usual form, and Clowney will be a big piece of that. The Bengals were favored -3, according to SportsBook Review, and, while it was a close game for sure, the Texans put on a superior performance on the night. The Bengals are in for a tough one next Sunday as they look for their first win in a game at Lambeau Field against the Green Bay Packers, while the Texans will look to ride their momentum to an equally tough Week 3 matchup against the New England Patriots on the road.